Once you’ve made that first sale it’s your chance to earn that customer for life…and their friends and family! 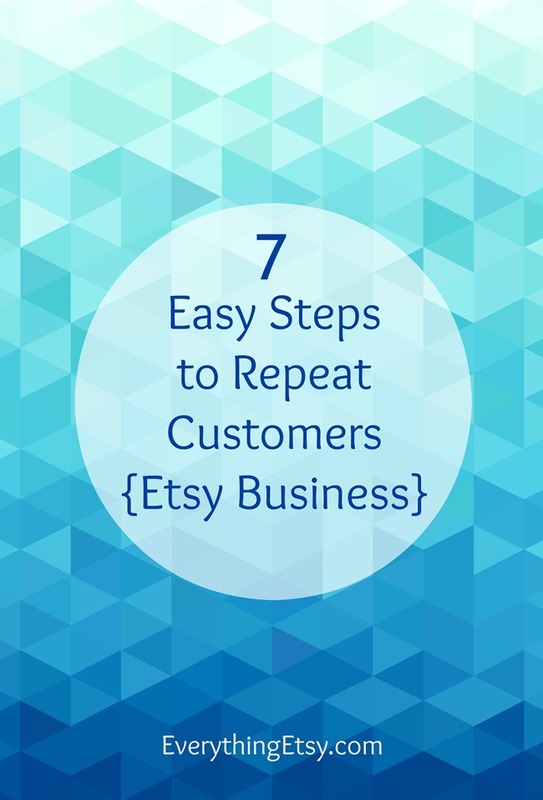 Use these 7 easy steps to repeat customers and you’ll see your business grow. These simple tips will help you stay in touch with your past customers. Keep the connection and you’ll reap the benefits for years to come. 1. Treat them like royalty and gain their loyalty! – Answer convos quickly and have clear shop policies to avoid any misunderstandings. Send emails to confirm their custom color selections or shipping instructions. Everyone likes to be treated with kindness, and when you show your appreciation to your customers with extra special care they won’t forget you! 2. Add something extra to their order – Surprise your customer with a little something extra. Try a gift tag, note card, magnet, bookmark,crochet heart or candy…whatever works for you. A small gesture of appreciation can give you great results. Try it. 3. Wow them with the packaging – The packaging is the first thing your customer sees when they open their order. Make it count…first impressions are big! Put a smile on their face by wrapping with care. Try cute tags, a colorful ribbon and a thank you. It doesn’t have to cost a ton to have a big impact, and over time you’ll find out what works best for you. If you’re looking for fresh inspiration check out this post… 16 Etsy Packaging Ideas! 4. Give discounts – Giving a buyer a discount on their next order could be that extra incentive they need to place another order or spread the word about your awesome shop. Try a few different ideas and see what gives you the most results. Add a note to your order encouraging them to follow you on social media to keep up with the latest products, limited items, and special discounts just for them. 5. Got a mailing list? – This is a great way to stay in contact with past customers. Introduce new products and share limited stock items. Share some behind-the-scenes photos of the making of your products…this will help them connect with you even more. Keep it simple and grow your email list with each sale. This works, trust me! 6. Fast shipping, Free Shipping & Easy Returns – I big puffy heart fast shipping! And free shipping, they say, are the two most powerful words in selling online. Or make life easy for your customers and take away the hassle of returns by including return shipping labels you only pay for if/when your customer uses them! 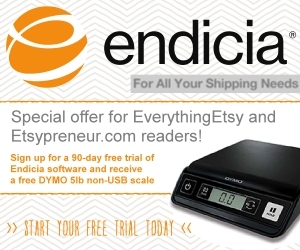 We wrote a little about this new feature from Endicia here. 7. Keep improving and growing your selection – Sales can go up and down for no reason at all…stay positive during slow times and work on your stock and photos. Get creative and try a new idea or two. Think ahead to upcoming holidays and start planning for huge sales! Your past customers will be watching and those new items will bring them back for more. They already think your awesome, so you know they’ll like your new products! Make each sale count and get a repeat customer with great customer service. Show them that shopping on Etsy is so much better than going to the store for their next gift. 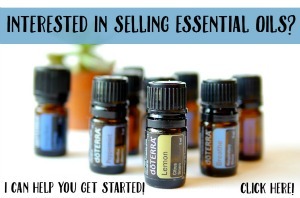 I’d love to hear what’s worked for you! Please share any tips you have in the comments! Yes, this is my question too! A – You do it soon… not three months later when they don’t remember your name. 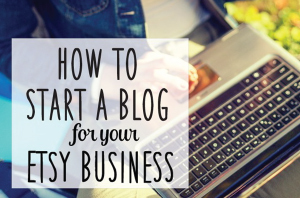 Ideally, you would get customers to opt-in and not just put them on an email list. But adding a customer to an email list isn’t breaking spam rules… they are a customer… you have a relationship so you can send them email. But the best way to do it would be to send an opt-in offer with some compelling reason for them to volunteer to be on your email list. My questions is about “free shipping”. Is this really “free” shipping or shipping costs included in cost of products, ie one of my Whipped Creams at $14.59 but with “free” shipping its $22.59 or something like that. I can’t speak for others but I can’t afford literal “free” shipping!. I do fast ship though so puffy heart that lol !! Great tips, thank you! The email is awesome, never thought of that. True, use it for current not history buyers. Also, I just flashed; using previous purchases zip codes to create my own ship to database and therefore offer more accurate ship fees. Anyone tried this? Has it worked? Hi! This really helped me, as I am just about to ship my first non-digital order. Thanks! I have also printed a coupon code on a business card to put with the package. Thanks again! Next Post The Fall Ad Sale is Open!